Natalie Dye is a postdoctoral scientist in Suzanne Eaton’s lab at the MPI-CBG, studying growth control and tissue patterning in Drosophila. 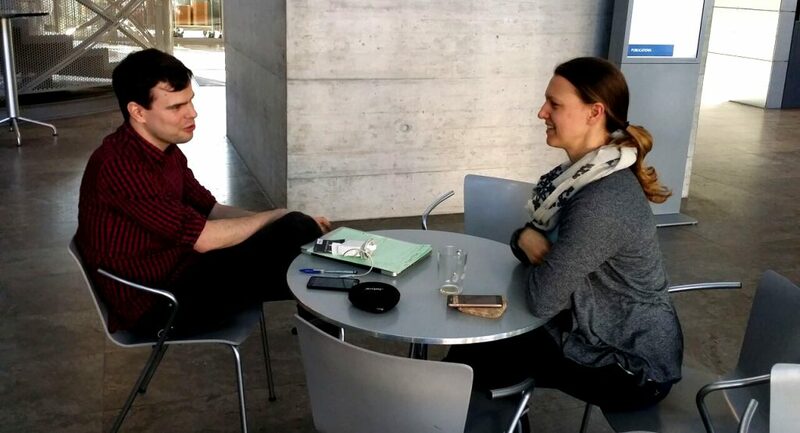 We caught up with Natalie in Dresden to talk about her career and research, her opinion on preprints, and her first impressions of being an active member of the preLights community. I was curious about many things as a young student, and I think I was really influenced by teachers and opportunities that drew me into one direction rather than another. It’s amazing to think how you can influence young people with little nudges and encouraging words – teachers have a really important job! I am continually fascinated by biology, though, even today, and I feel really lucky to be able to learn and research these biological forms as a living! Of course, it’s not an easy job always, but I like that my job involves discovery and exploration. You had an extremely successful PhD studying cell shape regulation in bacteria. For your postdoc, you moved continents to work on a multicellular organism – Drosophila – at the MPI-CBG in Dresden. What drove you to make such a big transition? At the end of my PhD I thought a lot of what I wanted to do. The questions I was trying to answer during my graduate work at Stanford were about self-organization, patterning, and morphogenesis at the cellular level. I wanted to scale this up and address these questions not in single cells but in tissues. I came here to the MPI-CBG because I really liked what the institute was doing; it was very much aligned with my interests of imaging, image analysis and using multidisciplinary approaches. I also thought it would be a fun opportunity to switch countries, at the time I had the flexibility and the desire to do it. What is the main focus of your current research? I am using the Drosophila wing imaginal disc as a model epithelium to understand how cells are shaping tissues during growth. Specifically, I want to understand how the amount and orientation of tissue growth is regulated to ultimately affect both shape and size. Therefore, I’m investigating how local and global signaling is playing a role in growth control. To answer these questions, I’m using live imaging and quantitative image analysis. What has been the most challenging aspect of your postdoc? When you switch systems like I have, everything is new. But I just had no idea that it would be so difficult to carry out the kind of analysis I wanted to do, which was to watch growth in the Drosophila wing disc. Probably the hardest thing was realizing that maybe my system isn’t as good as I initially thought, I was probably a bit naïve there. But in the end, I really like the direction that my research has taken. You have put your recent work on bioRxiv before publishing in the journal Development. Where do you see the biggest advantage of preprints? One of the things that preprints are especially great for is communicating any sort of new methodology. When I started to use ecdysone instead of insulin – what everyone else in the field was using – to promote growth in wing discs, I started presenting this at conferences. A lot of people wanted to use our method and asked for all the details. Once I had the preprint it was so much easier to send it to the scientists in my field to show them what I did. In addition, preprinting your work is a great way of getting feedback. It’s not uncommon that after receiving comments on the preprint, authors will think ‘hey, we have to make this a better story’ or improve certain parts of the manuscript for the actual publication. In fact, when I was writing my first preLight and was in contact with Alberto [Rosello-Diez], he told me that they were going to change part of the discussion of their manuscript based on my comments. Finally, being currently on the job market myself, I have to say that preprints are also great for career development. Instead of having to write that your manuscript is ‘in preparation’ or ‘in review’, you can automatically show your work with the preprint. Funding agencies also really appreciate having preprints on grant proposals as well. You mentioned that preprints are great for new methods. What do you think are the hottest methods and topics in your field and do you see them coming through as preprints? In my field – which is at the boundary of developmental biology, cell biology and tissue engineering – organoids are very hot. Organoids is where it’s at and everybody knows that. I’m highly biased, but I think that model organisms that are fast growing, genetically tractable and have simpler tissues still play a very important role in understanding tricky and complex questions in biology such as growth. In terms of more traditional developmental biology, live imaging using sophisticated image analysis and physical modeling is the state-of-the-art. It really is a great time for doing developmental biology now, since microscopy techniques and computational methods have advanced so much in the last decade. I do see many of these new techniques coming out as preprints. For example, recently from our institute there was a preprint on content-aware image restoration [this work was preLighted here]. But of course, there are still a lot of studies with important new methodologies that don’t come out as preprints before publication. Are there any reasons not to publish preprints? Scientifically, I don’t think so. If you have your work out there open for discussion – before publishing it in a journal – it will only improve your science. Of course, people can have different attitudes towards preprints, and I can respect that and see their arguments. For example, when preprints first started lifting off there was much more fear about ‘scooping’. Now preprints are citable – even though it’s not standard practice yet – and with preprints given more attention, people also show more respect to them. So, preprints also give some ownership to the work before publication. But I don’t think preprints will ever take the place of peer-review, we still need to have a forum where we critically evaluate the work and give reviews. Even if preprints won’t take over the role of peer review, do you think they are changing the face of publishing? Publishing is definitely under some flux right now. There are a lot of ideas and discussions on how publishing and the peer-review process should change. Should it be done by paid people, people inside or outside of science, should reviews be open, should they be signed? I don’t know yet what all the answers will be but it’s important to have these open discussions for change to happen. Preprints are definitely playing a big role in promoting an era of openness. Regarding the publication process, preprints allow earlier feedback to authors, but at the same time reviewers can already read the comments and discussions around a preprint. This could affect their review process – I don’t know if this is for better or for worse. Why did you decide to accept the invitation to become a preLighter? I had already been thinking about how to increase my own online presence. Then, the invitation to become a preLighter just fell into my lap and I thought this would be a great and fun way to do it. Being a preLighter also gives me extra motivation to keep on looking for new interesting things by regularly scanning the latest preprints. It’s a great way to get practice for writing for my peers – which is quite different than writing to the public, something I have also enjoyed doing during my graduate time. Finally, it’s a really cool club to be in with lots of energetic young people, so I’m happy to be a part of such a network. You’ve already written two preLights pieces, how did you experience the interaction with the authors of the preprints that you highlighted? For both preprints I highlighted, the interaction with the authors has been very positive. For my first preLight I was in email contact with Alberto, who is actually a preLighter himself. He pointed out some small errors, and as I mentioned before, told me that they would incorporate my feedback into the discussion of their manuscript, which was nice to hear. I did my second preLight on a preprint from Lucy O’Brien’s lab. Lucy also gave good feedback and was very excited to have the extra press, she thought the preLights project is a great initiative. You and preLighter Anna Kicheva separately had a post on the same preprint. Would you like the idea of teaming up with another preLighter to write a post together? I think it’s definitely a good idea and I would be happy to do it, especially if it was someone from my institute or someone that I already know and then we could Skype about it. I also realized during writing both of my preLights, that sometimes after having an idea I questioned myself, am I really right about this? Therefore, it would be fun to discuss these things with another preLighter. The reason I didn’t write the post together with Anna was purely practical, we were on different time schedules and it was logistically hard to coordinate. I’m really excited about another paper in-the-works, and then after that, I’ll be looking to move on to another position. Finally, tell us something that people might not know about you? I started rock climbing during graduate school; we used to go almost every weekend to Yosemite, which was only a 3-4-hour drive. I still do climbing here but it’s a lot different; first because of the weather, and secondly because it’s a no metal protection climbing area here in the Saxony Switzerland area, which is very different (and a little terrifying at first). So, moving to Dresden was not only a big change in my professional life, but also in my personal life!